On Saturday, my husband and his friend got REAL pizza to enjoy while they watched the World Cup. I decided to make my own pizza crust, with leftover juicer pulp. I’ve made this several times before going low FODMAP, just as a way to get more vegetables and reuse the pulp instead of throwing it out. I originally found the veggie crust pizza receipe on My GI Journey, but modified it for low FODMAP purposes, and for juicer pulp purposes. The result: a delicious, semi-vegetable lasagna-like pizza, that I really enjoy eating. I can eat a lot of it and not feel like I’m bursting at the seams, and I know I’m getting a lot of fiber. 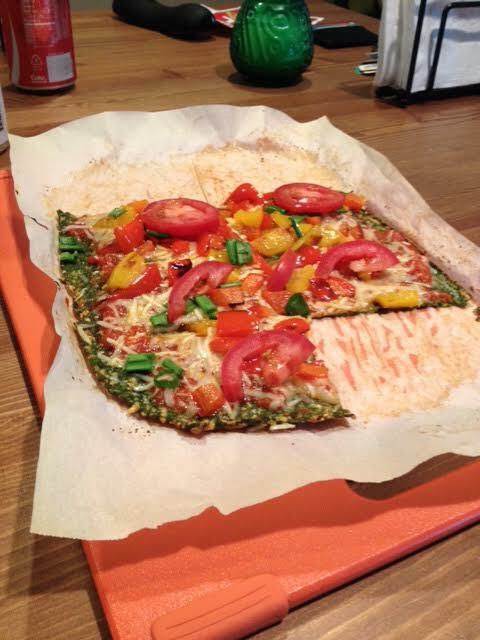 The juicer pulp pizza is so colorful and festive! It looks so much better than any gluten-free pizza I’ve had so far. I’m not entirely sure anyone follows this blog, but just in case, I’m including the recipe, for my own reference and maybe others as well. -Leftover juicer pulp. I used leftover spinach, kale and carrot pulp, which I juiced first, put into a baggie, and then juiced my fruits afterward. I don’t measure this out, so I will say the pulp leftover from roughly 10 baby carrots, and 6 large handfuls of spinach and kale (we get ours in a combined bag). -Dried Italian spices. Make sure there’s no garlic salt or onion salt in the mix! I use an Italian herb mix with basil, oregano, marjoram, and rosemary. Again, no measuring, I just shake in a bunch. -1 cup shredded mozzarella or 1 cup shredded parmesan cheese. I’d err on the side of the parmesan because it’s a “harder” cheese, but I’ve used both of these before and have not had any lactose or casein issues. 1. Heat oven to 425F. 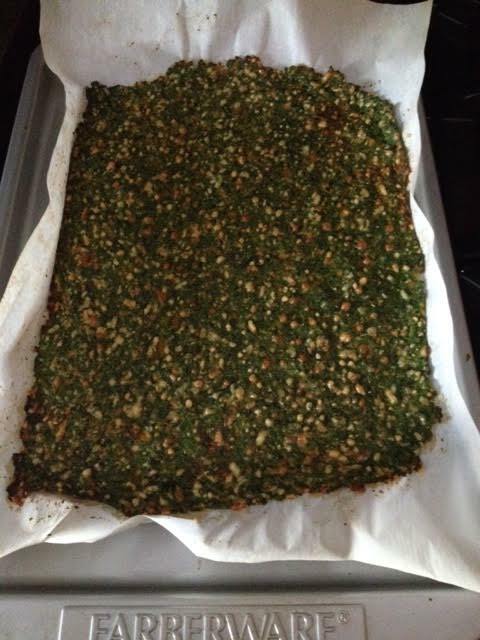 Line a pan (square or round) with parchment paper. This is crucial so your pizza crust doesn’t stick. 2. Put pulp into food processor, break down a bit by pulsing several times. Add spices, egg, and cheese. Pulse until fully combined. 3. Arrange pulp mixture onto parchment-lined pan, either in a square or circle. You may have to squish down the pulp a lot to get it to spread evenly and across the pan. I have never successfully made a pulp pizza that covered an entire pan, probably because I don’t measure, so if you want a large pizza, use a lot of pulp. 4. Bake for 15-20 minutes so crust gets somewhat crispy. Again, crispyness will depend on thickness of crust. It will get shiny on top when done. 5. Remove from oven, and top with your desired toppings. I used Rao’s Sensitive Stomach spaghetti sauce, red and yellow peppers that were sauteed in olive oil, and mozzarella cheese. 7. Remove, cut into desired shapes, and consume. I added tomatoes at this point too. *Note regarding the pulp: I freeze all my pulp until I’m ready to use it for crust, so I take the frozen pulp out of the freezer several hours before making crust and put it in the fridge, or thaw it in the microwave. If you also do this, you will have strain water from your pulp before processing it, or else the crust will not get crispy. Just a FYI. I put the pulp in about 5 paper towels and squeeze over the sink until water ceases to come out. The juicer pulp crust pizza is a huge highlight for me this week! I already loved it, and now I love it even more as part of a low FODMAP diet. 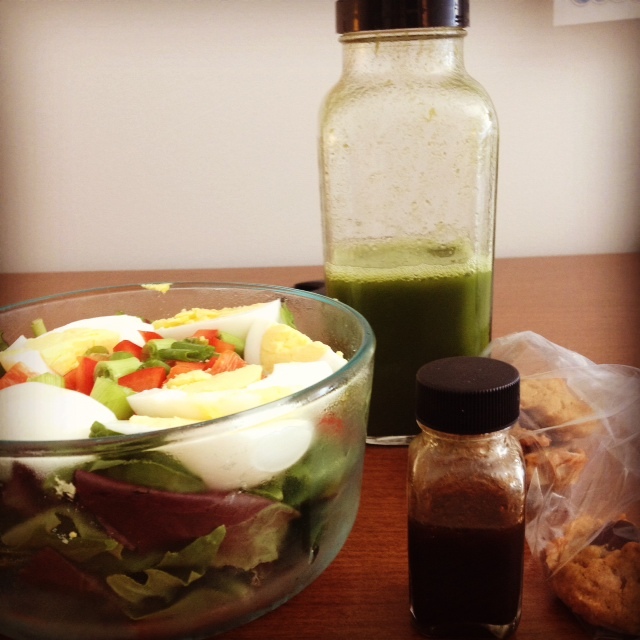 Also, my planning is improving, as evidenced by my low FODMAP lunch and snacks from last Friday. I made it all, and brought it all to work. Never once did I have to run downstairs to the general store and try to find a low FODMAP or FODMAP free snack item! This week, I was also trying to make gluten-free, dairy-free sweets, so I tried to make the Detoxinista peanut butter bars with her mounds truffle recipe for the middle, instead of peanut butter. The result was good, but the peanut butter recipe is just easier. Also, I’m not sure how low FODMAP coconut actually is. Again, this is my journey into acceptance: I love coconut, but I might have to save it for special occasions only. Boo hiss. Goals for this week: Continue to eat more fiber. I’ve been eating more vegetables and incorporating chia seeds into my smoothies, which seems to be helping. Also, continuing my journey of acceptance. As long as I am living low FODMAP, I need to wrap my head around the idea that things will be different, and sometimes a substitute is just that, and it’s not going to be as good as the real thing. And that’s OK!